Do you or someone you know love visiting sites of cultural interest (churches, stately homes or landscaped gardens)? Just as we have more time to make these cultural visits, they can become significantly harder to enjoy. For some people, the stairs at historic houses (worn old steps, no handrails) or the steps in landscaped gardens, can add unnecessary anxiety and difficulty to what should be an afternoon of discovery and relaxation. Age Space asked me to write an article about this for their site. In this article, I share some suggestions for researching visits ahead of time. I include suggestions for making visits easier, even where difficult staircases cannot be avoided. Please share with friends and family who you feel might find it helpful! 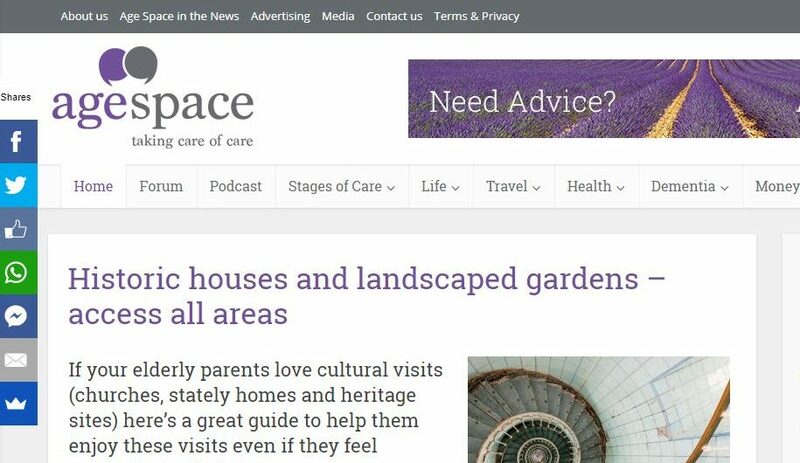 Age Space is the one-stop online resource for anything related to care advice. They do the hard work for you, researching the best organisations, resources and information to guide you in making the best decisions about care and support for parents or relatives.